The Hanseatic Town of Visby on the island of Gotland is a well-preserved early Hansa town. The city flourished thanks to the German Hanseatic League: it was its main centre in the Baltic from the 12th to the 14th century. Together with Bruges and Talinn it is considered to be among the top 3 of Hanseatic towns. Among the most notable historical remains are its medieval street plan, the 3.4-km long stone wall called "Ringmuren" that encircles the city, the merchant houses and romanesque churches. With my visit to Visby over the past weekend, I finally ‘finished’ Sweden. I did so on a nightly public transport expedition of over 1,600 km: bike from my house to local train station (5 min) – train to airport (45 min) - fly Amsterdam to Stockholm (1.5 hr) – pricey Arlanda Express train to Stockholm central station (20 min) – Batbussen to Nynäshammn (45 min) – ferry to Visby (3h15 min), arriving at 5.45 in the morning. If you ever end up on the streets of Visby via the same early ferry, I’ve got two practical tips for you: (1) Marthas café opens early for breakfast, at 6 am on weekdays and 8 am on Saturday, and (2) there are hammocks for public use along the beach road next to the botanical garden to catch up on your sleep. After breakfast and having tried to get some rest on a park bench (I only discovered the hammocks later in the day), I started my visit properly with a walk along the exterior of the city walls. They do not look that impressive coming from the harbour, but that's because it is the only part of the structure where the full circle is interrupted. The other 3.44 km of the in total 3.6 km is intact. The wall, which is up to 10 meters high, is reinforced every few meters by a tower. 36 of those are still standing and that adds to the wall’s majestic look. Alternating with the slender towers there are also lower 'saddle towers'. Especially these are struggling to stay upright; from the end of the 19th century on they have been supported by iron poles. The sandy walkway along the wall is just wonderful for an early morning walk. I can imagine that if you live here you do this loop every day: I met many people jogging or walking their dogs. This surely must be among the Top 3 of city walls on the List, rivalling the one at Carcassonne with its numerous towers and height. Within the city walls my first stop was the Gotland Museum. It shows the history of the island where Visby is located. It has exhibitions across 3 floors, but the best is already right at the entrance: a hall full of rune stones. Well-known from the rest of Scandinavia of course, they often only have inscriptions. But the Gotland ‘picture stones’ also have pictures and geometric motifs. Just like with petroglyphs, the people carved scenes from their daily lives into the stones. So there are many images of ships here! The museum also exhibits wooden sculptures from Visby's churches. The old town had no less than 12 churches in its heyday. These arose by the grace of the international contacts of its inhabitants: it apparently also helped your commercial position to say that you’re a Christian. Nowadays there is only one in use, the big 13th century Domkyrka. The rest of the churches still adorn the streets in a dilapidated state, which is a somewhat odd sight as they would have been cleared away over the centuries in most cities. Most are also closed to the public because of their condition. But I can recommend a visit to the double church of St. Hans and St. Peters where a cafe has built its terrace among the church ruins. I had expected more from the old houses and public buildings in Visby's town center. Or better said: I had expected something else. Most buildings date from the 17th, 18th and 19th centuries and are therefore far from medieval. I also did not discover one to enter (with the exception of the omnipresent souvenir shops selling woolen products). Visby is sometimes compared to Bruges, but this is a completely different cityscape and certainly lacks the cramped medieval housing conditions. It's also not comparable to the later Hanseatic towns such as Gdansk which I recently visited. It has a much more generic Scandinavian feel to it. I visited this WHS in June 2018 as a day trip from Stockholm. There are frequent flights daily from around 07:30 till 19:00 from Bromma Airport with SAS and the cheaper Braathens Regional Airlines (BRA). My visit happened to be just a few days before the Almedal Week, known as the biggest 'political' festival in Sweden so booking well in advance was an asset to secure the cheapest options available. If you travel from Stockholm on a sunny day, try to secure a window seat on the left hand side of the plane (first come, first served basis on BRA) as the panoramic view of the walled town with the Baltic Sea in the background is worth viewing before landing. During the summer months, the Flygbussarna Airport Coaches offer a shuttle service to the city centre which is timed around 15 mins after each arrival. Tickets can be bought on the bus with credit card only and free city maps, leaflets and wifi are available on the bus itself. It's not a very long walk if you want to save money and are not pressed for time. The bus stops 3 times at different points around the city walls and after less than 10 mins I decided to stop at the first stop, Norgatt (photo - morning light is great here for photography), to enjoy a lovely walk around the 3.4km ringmuren or town wall built in the 13th and 14th centuries with 27 preserved ground towers and 9 hanging towers. It really reminded me of Tallinn, Estonia but in Visby it's not possible to walk on the walls themselves (even though some of the towers are accessible). I really enjoyed walking through all the different roads and alleys to take in the different architecture styles and facades of the houses and buildings. There was an antiquities (Loppen!) market in the main square or stora torget and it was great to see the town still pretty much alive mostly with locals. The fact that Campus Gotland, a campus of Uppsala University with over 4000 students and a former university college, is located in Visby helps to keep the town alive almost all year round. The second largest square is Donners plats where you can get some more information at the town hall and visitor centre. Nearby there's also Gotlands Museum which should not be missed. The ticket is a daily ticket so you can go in and out of the museum and explore different parts or floors at leisure. Apart from the main attraction of the museum, namely the picture or rune stones and memorial crosses of Gotland island, there are 3 floors dedicated to Visby and Gotland in general as well as the Vikings. It is also a good opportunity to view one of the storehouses' interior. Apart from the rune stones, another highlight of the museum was the Stavars treasure found by chance in 1975 with some 1441 arabic silver coins and spiral rings from the mid 10th century as well as the hoards from Spillings unearthed in 1999 and weighing around 67kg. These contained objects from 20 different countries mainly in the Middle East and from several other WHS such as Santa Maria del Naranco, near Oviedo, Spain, Bukhara, Uzbekistan, etc. Scattered within the stone walls of Visby are the ruins of 12 churches which had been erected in the 13th and 14th centuries and were largely abandoned during the 16th century Reformation. 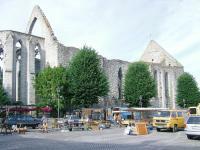 Shortly after the Reformation, in 1572, the main church was the only church to be rebuilt and it became Visby's Cathedral. One of the stained glass in its interior depicts the walled town of Visby and is worth viewing. Gotland island was ruled by Danish castellans at the former Visborg castle or fortress in Visby. The building of the Visbory castle was initiated in 1407 by the crusaders and the Order of Brothers, commonly known as the Teutonic Knights. If you have more than a day in Visby, a rental car would come in handy to explore different parts of the rather large island of Gotland. I wouldn't be surprised if Sweden try to include some small natural site or component in Gotland in the Rise of Systematic Biology tentative WHS. Linnaeus visited Gotland in 1741 after visiting Oland to investigate and record all the species he could find on both islands. The oldest tower in the stone walls is Kruttornet close to the relaxing green area (best light for photography is in the afternoon) of Almedalen. Behind the tower is another worthwhile green area to explore, the botanical garden, with one church ruin and an interesting tower wall which you can climb to get a panoramic view over Visby. After a delicious lebanese early dinner at Beyreuth restaurant, I walked back to the bus station for my return shuttle trip to the airport and back to Stockholm. I managed to explore all of Visby in a day since I had to be back in Sweden for a family function the day after, but if you have more time to spare, try to explore the rest of the island of Gotland. All in all, I think Visby is Sweden's best cultural WHS. Thanks to one low cost airline last-minute promotion that made me decided to visit Gotland where one of the World Heritage Sites - the Hanseatic Town of Visby, the island's capital, located. Since the visit was really unplanned, I did my best to see the city for one and a half days without knowledge or expectation, but turn out to be one of the best World Heritage Sites of Sweden I visited in this trip. Even with the promotion, our plane still had only 6 passengers! And when we landed on Visby Airport, there was no taxi at all, we tried to ask airport staffs, but no one knew how to call taxi! Luckily that one passenger called a taxi for us from a small phone box at the airport entrance. Finally our taxi arrived and took us to the town center. When our taxi reached the town, the view was quite stunning with high medieval town wall, towers and defensive gates. After we got a place to sleep, the first place we went was Almedalen, which was a beautiful seaside park. I really liked this place and the view of the town was just amazing, from here I could see many church spires, town wall, and many styles of building architecture. The next place was the Gunpowder Tower which was a tower part of the town wall next to the sea. Then we went to see the Botanical Garden, the garden was lovely with many spring flowers, also many small alleys in this area were very pretty with cute houses. The beach promenade and the northern section of Visby wall were also worth detour, after that we saw many ruins of churches, the only still functioned was the Visby Cathedral; inside the cathedral especially the brass chandelier was quite lovely. The next day we saw the Visby Museum - Fornsalen, the museum had great collection of runic stones and many silver treasures. It also had exhibition about war and armor, we really surprised with the weight of armor that ancient solider had worn. The rest of the day we explore the town center that full of many styles of buildings, Visby was a treasure box of northern European architectural styles, it was a great surprised to see many styles in such small town and harmoniously integrate in the townscape. We loved the goat statues, the symbol of Gotland that can be found in many places. We also enjoyed food and drink in Visby, the food quality was surprisingly high with interesting fusion of Mediterranean and local ingredients, Gotland blended tea was also nice and perfect for souvenir. We returned Stockholm and really missed our short but happy Gotland experience. Visby maybe not unique as it was quite similar to other Hansa towns; however, it was a great contrast to other Swedish tourist attractions in the mainland and made us felt rewording after explored the place. I reached Visby in 3 hours by ferry from Oskarshamn, a short train + bus journey from Kalmar. After entering the town through the Osterport, I spent a morning walking the streets of the old town visiting the various ruined 12th century churches, as well as the more interesting and undamaged Domkyrkan. I found it a shame that Visby's waterfront was obscured by huge storage tanks. 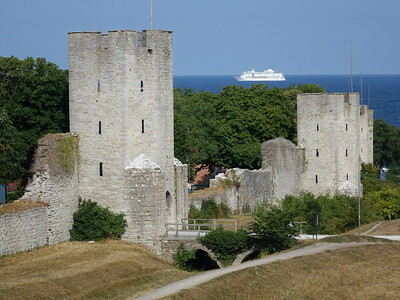 A few years ago I did a short cruise of the Baltic Sea, and I chose a particular cruise because it included Visby. I did spend a few hours walking through the historic streets, but unfortunately it was raining so heavily and the wind was blowing so strongly that it really was no fun at all. I did see the museum, which was definitely very interesting, but the rest I could hardly see (and it was the beginning of July!). Fortunately, on my second visit (by ferry from Nynäshamn), the weather was much better (also in July). So I could finally explore all the parts of Visby I had missed the first time around, in particular the very impressive city walls. 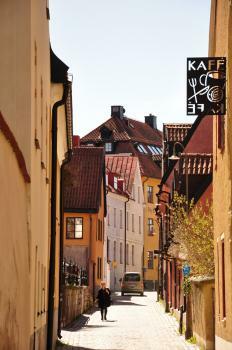 If you are lucky with the weather, Visby is one of the finest historic cities in Northern Europe. Having visited a dozen Hansa towns around the Baltic Sea you certainly get a fair share of de-ja-vu when strolling on the narrow streets of Visby. In this Hansaetic town on the island of Gotland located in the middle of the Baltic Sea, you can’t avoid feeling the presence of Lübeck, Riga, Danzig, Tallinn, Stralsund and Wismar and even Novgorod the Great in Russia. And it wasn’t actually until 1645 at the Treaty of Brömsebro, that the island became truly Swedish. Vikings, the Hansa and Denmark did their best to run the town and the island through the previous centuries. The most notable objects in Visby is the 3,6 km long stone wall – Ringmuren – said to be the best preserved in its kind in Northern Europe. The wall with its many towers encircles the old town and protect the many cathedral ruins and the small merchant houses. Visby is also one of the most popular destinations for tourism in Sweden making it completely swamped with people between mid-June until mid-August. It is therefore my advice to try and avoid those months unless you are heavily into partying with the Swedes, something that also could be quite a fun experience…! If you are hooked on Vikings, the island of Gotland is virtually littered with remains but an absolute must is to visit the small museum in Visby – Fornsalen – where you find an absolute brilliant collection of runic stone, truly the best of the best you can find; brilliantly decorated stones telling stories about wars, foreign travels and domestic dramas. In my personal opinion, Visby is the cultural World Heritage Site most worth visiting in Sweden. Getting there, you can either catch the fast-ferrys from Nynäshamn or hop on one of the almost hourly planes from Stockholm. Allow at least two hotel nights to get the feel for this brilliant Hansa town and maybe stay on for a few extra days to discover the rest of the island. No doubts - this city deserves to be on the UNESCO list. It is very picturesque, and quite well preserved. In a way the city with its limestone cliffs, ruins of ancient churches and sea at the horizon resembles something from Southern Europe - but still very different. I was impressed by the fortification wall. 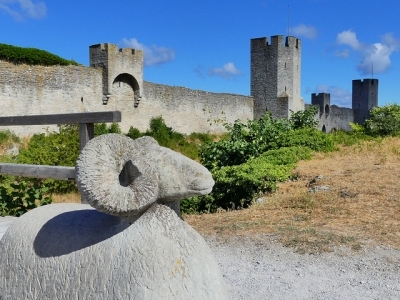 If it happens for you to visit Sweden - do not forget Gotland and Visby - it is wirth a visit! Teutonic Knights: Granted to the Teutonic Knights on condition that they expelled the Victual Brothers. This they did in 1398 destroying Visby in the process. In 1409 they sold the island to Queen Margaret of Denmark, Norway and Sweden. Piracy: Occupied by the Baltic Pirates "The Victual Brothers". They made it their HQ in the Baltic until they were attacked by the Teutonic Knights in 1398 when the city was destroyed. Viking settlements: "Excavations have indicated that there was a trading settlement in the early Viking Age on the site of Visby"
Botanical Gardens: Visby's Botanical Garden is within the city wall area, the inscribed zone. Carl Linnaeus: In 1741, he visited Visby which reminded him of Rome (where he had never been). Built or owned by Germans: Burmeister House (by wealthy German merchant Hans Burmeister); Many of these houses of worship were built by wealthy Germanic families who made their fortunes trading, bringing Christianity – specifically the Lutheran denomination – when they settled on the island.